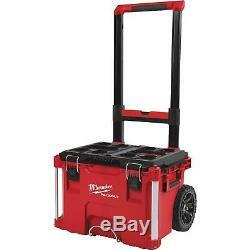 Milwaukee Packout Rolling Toolbox- 22.1inL x 18.9inW x 25.6inH Model# 48-22-8426. The Milwaukee® Packout Rolling Toolbox is part of the versatile and durable Packout modular storage system designed for the professional tradesman. Packout provides users with the ability to interchange and interlock a wide assortment of Packout heavy-duty toolboxes, organizers and storage totes in many different configurations. The rolling toolbox is constructed with impact-resistant polymers, an industrial grade extension handle, 9in. All-terrain wheels and metal reinforced corners to provide up to 250 lbs. Of weight capacity in harsh jobsite conditions. Features an IP65 rated weather seal to keep out rain and debris. The rolling toolbox is fully compatible with all Milwaukee Packout modular storage products. Handle Type: Stainless steel extension handle, Handles qty. : 3, Color: Red, Dimensions L x W x H in. : 22 1/8 x 18 29/32 x 25 5/8, Handle Included: Yes, Includes: Handle, (2) Wheel, Lock Type: Locking ring for padlock (not included), Material: Impact-resistant polymers, Product Type: Packout system, Wheel Included: Yes, 2, Wheel Size in. Rolling toolbox is part of Packout modular storage system. Constructed with impact-resistant polymers and metal-reinforced corners. IP65 rated weather seal keeps out rain and jobsite debris. Mounting location for One-Key Tick heavy-duty latches. If a PO box address is submitted without a physical address it may delay your order. We may already have an answer to your question! We reserve the right to correct ad errors and/or omissions. Pricing and availability is subject to change without notice. The item "Milwaukee Packout Rolling Toolbox- 22.1inL x 18.9inW x 25.6inH Model# 48-22-8426" is in sale since Wednesday, September 19, 2018. This item is in the category "Home & Garden\Tools & Workshop Equipment\Tool Boxes & Storage\Tool Boxes". The seller is "northerntool" and is located in Fort Mill, South Carolina. This item can be shipped to United States.